I spent a lot of time during my summer holidays in 2013 knitting a winter weight jumper for me. I don't know why I feel the urge to knit highly inappropriate things in the middle of a sweaty hot Australian summer but it may have something to do with the fact I'm on holidays and have time on my hands to just knit! I'm finding as I get more experienced as a knitter, I like to knit things primarily for the challenge or to learn a new technique. And that's how this jumper leaped it's way to the top of the "To be Knit NOW!" queue on the 1st of January 2013. It's the classic answer to the age old question: "How do you fit a square peg into a round hole?" or something along those lines. This design. Imbolc by Josie Mercier from Knitscene, Winter 2012, is based around incorporating a circular counterpane into a fairly plain stocking stitch jumper. Actually the motifs are more hexagonal in real life.They are knitted from the centre out in the round using 4 double pointed needles. And that's where the challenge comes in. I had to teach myself Judy's Magic Cast On to seamlessly begin these. (Judy's Magic Cast On was created by Judy Becker as a way to seamlessly cast on for toe up socks. It produces a row of stitches on either side of a needle. The YouTube video I used when teaching myself this is available here). The lace counterpanes are what gives this pullover / sweater / jumper its name: Imbolc. Imbolc is a Gaelic festival marking the beginning of spring. Like most of the Celtic seasonal fire festivals, it is celebrated with bonfires and candles. There is something that suggests flames and stars and bonfires or flowers and spring in this lace motif. It was great fun to knit and took me less than a month to finish, pretty good going for an adult size jumper being made in weather where air conditioning is a must to be able to knit without the wool slipping off the needles due to excessively sweaty hands. The assembly was a little tricky. The lace counterpane pieces had to be blocked very carefully to fixed dimensions. The front and back are knitted conventionally with a half hexagonal cut out on each side seam. The counterpanes were carefully coaxed to fit the openings after the side seams were completed, pined and then delicately stitched in place. And here's where I just let time get away from me. A garment isn't finished really till you get photos of it for its Ravelry Project page and to blog about it, right? Well for various reasons this one has never had its chance for a photoshoot. When I finished it, it was too hot to even contemplate wearing it. And despite wearing it lots last winter, I never wore it when I had a competent photographer around. 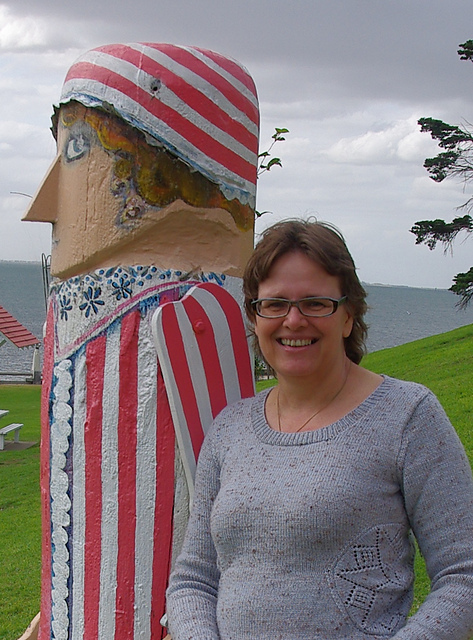 So finally today, 26th April 2014, I deliberately wore it on a road trip taking the boy back to his University in Geelong at the end of his Easter Holidays. I grabbed the camera, knew I had a competent and efficient child who takes awesome photographs of knitted garments and the potential for some great scenery. The waterfront at Geelong is very picturesque with a walking trail and parkland running from a turn of the century pleasure pier, past a yacht club and an antique carousel to the sea baths and outdoor pools complete with fountains at Eastern Beach. 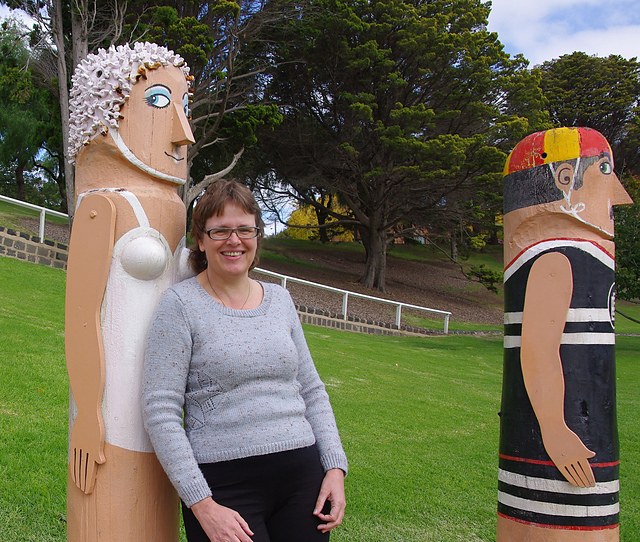 Along the way, there are over 100 painted bollards representing the people and history of Geelong. Plenty of scope for pretty pictures (Even if it is difficult to take a good shot of the model some days). Pattern: Imbolc Pullover by Josie Mercier from Knitscene, Winter 2012. Needles: 3.25 mm needles for bands, 4 mm needles both straight and dpns. Yarn: Cleckheaton Country Naturals 8 ply Pale Blue / Gray - 12 balls and I used pretty much all of these with only a very samll amount left over. (Thanks to the boy for the photographs. Thanks to the rest of my family for a really nice day out and an awesome seafood lunch).